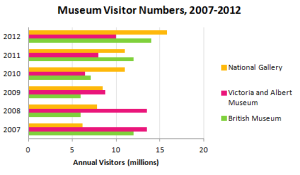 Instruction: The graph above shows the number of times museums have been visited. 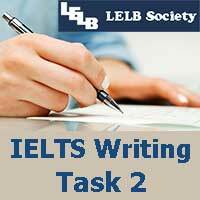 Write a report for a university lecturer describing the information in the graph. You have about 20 minutes to complete the report that includes at least 150 words. 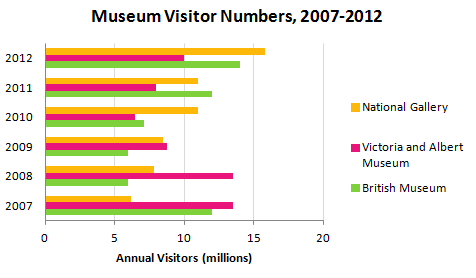 This graph compares the number of visitors who visited National Gallery, Victoria and Albert Museum and British Museum between the years 2007 and 2012. The visitors who visited the National Gallery rose gradually from years 2007 to 2012. It seems that it has attracted so many attentions. Victoria and Albert Museum experienced noticeable visitors during the year 2007 and 2008, approximately 14 millions, but after that the number of visitors decreased drastically near 9 millions and its trend continued even the following year which the number reached 6 and a half millions. Then it slightly grows and reached up to10 millions on the year 2012. The visitors of British Museum, was approximately 12 and a half millions, then the number of visitors dropped by a half in following year. After that it started to grow gradually and constantly.